mama elephant | design blog: Mama Elephant June Sneak Previews! Mama Elephant June Sneak Previews! Hi everyone! Welcome to our June Release kick-off! We are sneaking some of the new stamps today. We've got 5 great sets for you to hold you over the Summer. That means the next release scheduled is our big mama September Anniversary one! The first one is Book Worm, which is sort of a followup to Page Huggers, just a little smaller. It pays homage to the reading enthusiasts in all of us. It's a great back to school/teacher's appreciation set. We've got some adorable cuties getting all nerdy with their favorite books! While Book Worm is chocked full of images, we needed a great companion set of sentiments to go along with it! 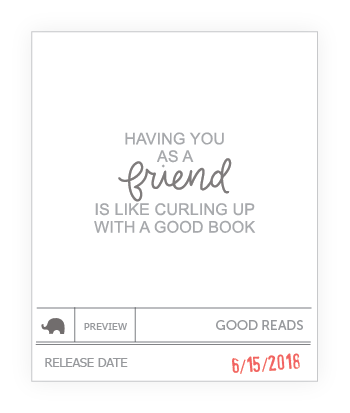 You'll love the awesome sentiments in Good Reads! We've also got Paola Esteron joining us this month with her beautiful hand lettering. Instead of the usual happy birthday, or thank you, we wanted something that celebrates and encourages our craft! 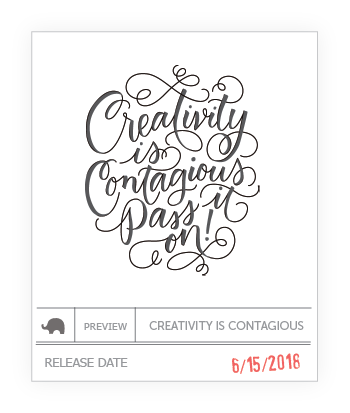 Creativity is Contagious - Pass It On! This phrase speaks volumes to our world, doesn't it? Aida Zamora's also got a set with us called Dandelion Wishes. You've got all these cuties blowing dandelions for their wishes, is that not cute or what?! 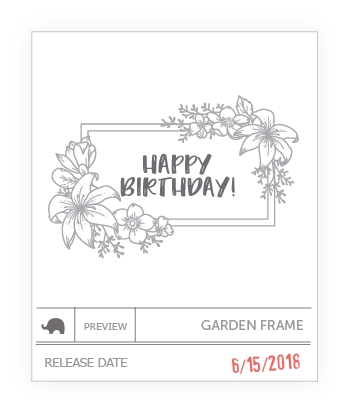 Finally, we have this beautiful floral frame set that is great for quick and easy cards! Garden Frame features a large cluster of flowers in a frame paired with some whimsy fonts. Such a fun, versatile release, don't you agree? What's your favorite so far? Good Reads and Dandelion wishes!!! Oh my goodness, "Book Worm" and "Dandelion Wishes" are so cute! And for me as a bookworm, "Good Reads" looks like it's going to be super useful. I can't wait to see the sets in their entirety! Going to need book worm and dandelion wishes for sure. So adorable! Oh how adorable, I love the whole library card theme!! When will they release. Oh my goodness these are ALL SO sweet! (I hate it when people ask for our faves...LOL They are ALL SO DARNED GREAT!) I guess to pick just ONE, I'd have to go with the Garden Frame as I love flowers and they look great for colouring! Love "book worm and dandelion wishes"!! Super DUPER cute! Aww, bookworm and dandelion wishes are just too cute! And i love cute! But for more elegant occasions, i love the happy birthday frame! 'Dandelion wishes' is adorable! Can't wait!! So much cuteness! !, loving the Book Worm and Dandelion Wishes! Bookworm and Dandelion wishes look to be so cute. So sweet 😊 The bookworm is super cute!! Love the dandelion wishes and the book worm. So cute. Sp cute to have Book Worm AND Dandelion Wishes. Yes, I need each! These all look delightful!! I'm so SUPER excited to see the Book Worm set and LOVE that it's sort of a companion set to the Page Huggers - which has to be one of my all time fave stamp sets! It's just so versatile! Can't wait to see more. Loving the Garden Frame set. Aw, you win...I see I will be buying more stamps...I love books and reading! OMG as a huge bookworm I have to have these stamps!! Adorable book worm!!! Looks like another awesome release!! Oh the ideas are already swirling! Such cuteness! Huge bookworm here sonthis made me smile BIG! I really LOVE the bookwork set and the adorable critters with dandelions!